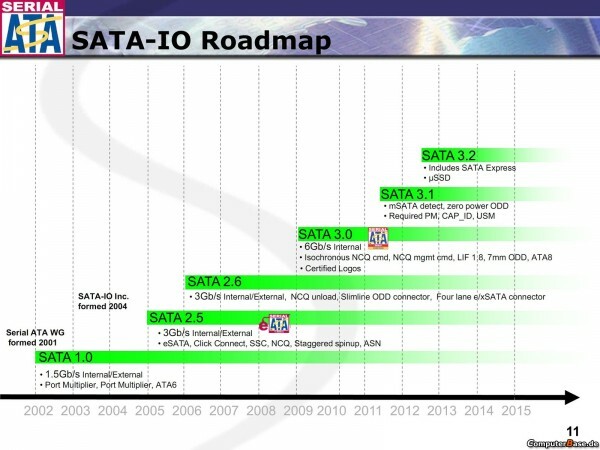 The SATA organisation or (SATA-IO) reveal a new standard of SATA interface, the SATA V 3.2 with new improvements and enhancements over the current 3.0 6Gb/s standard. The SATA 3.2 is designed for better power managements with SSDs, faster performance and add new thinner design for ultra thin devices, new specifications allows SATA and PCIe solutions to coexist, that mean more than twice performance with 2GB/s (2 lanes of PCIe 3.0) and can reach up 8Gbits/s Vs 0.6GB/s for the SATA 3.0, thanks for the new SATA Express architecture. SATA revision 3.2 also incorporates the M.2 form factor, enabling small form-factor M.2 SATA SSDs suitable for thin devices such as tablets and notebooks. M.2 (formerly known as NGFF and defined by PCI-SIG®) is a small form factor card that supports a variety of applications including WiFi, WWAN, USB, PCIe and SATA. microSSD – standard for embedded solid state drives (SSDs) that enables developers to produce single-chip SATA implementations for embedded storage applications. Universal Storage Module (USM) – enables removable and expandable storage for consumer electronic devices. 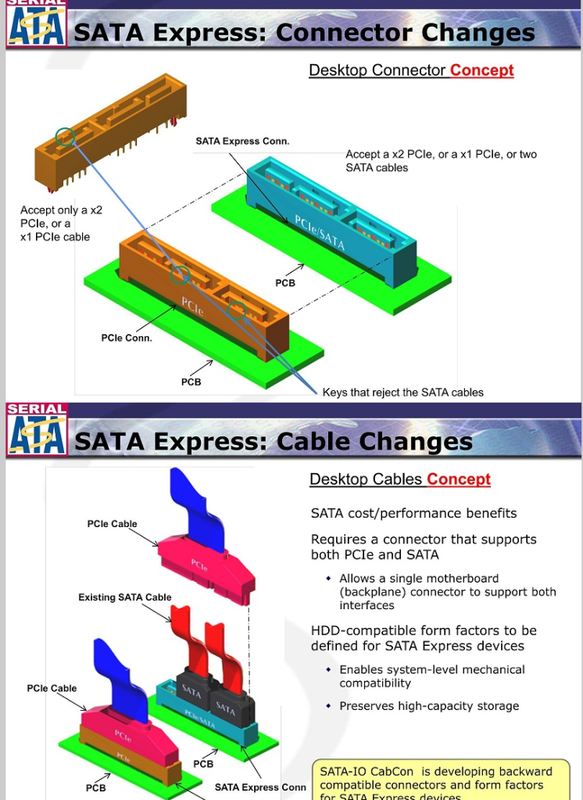 SATA revision 3.2 introduces USM Slim, which reduces module thickness, allowing smaller removable storage solutions. DevSleep – the lowest yet level of power management where the drive is almost completely shut down, to meet the requirements of new always on, always connected mobile devices such as Ultrabooks™. Transitional Energy Reporting – provides the host with detailed information about the SATA storage device, facilitating better power management. Hybrid Information – provides a mechanism in which the host can communicate data caching information to the drive, improving solid state hybrid drive (SSHD) performance. Rebuild Assist – speeds the data reconstruction process in RAID configurations.